The pain of Knee Osteoarthritis (OA) or the pain after Knee Replacement Surgery can never be described in words. To make the knee move is probably the last thing a person wishes to do when his knee is in pain. But the fact is that only knee movement can help keep the knee pain away. To improve knee functioning&flexibility, an individual suffering from knee pain needs to do exercises that target quadriceps, hamstrings and glutes. How to do Standing Quadriceps Stretch? Stand straight (place your hand on the wall for support) &feet spread hip-width apart. Bend your right knee and hold the top of your right foot with your right hand. Bring your right heel as close as possible to your glutes. Hold for 30 seconds, and repeat on the left leg. Do 3 times once in a day. How to doStanding Calf Stretch? Stand with your right leg in front of you and your left leg behind (you can place your hand on the wall for support). Slowly bend your right front knee and lean forward, pressing the left heel towards the floor to stretch your left calf muscle. Hold for 30 seconds, and then slowly relax. Repeat the stretch twice more before switching sides and repeating. Do 3 times daily. How to do Seated Leg Raise? Sit up straight on a chair with both legs bent at 90°. Keeping your left foot on the ground, slowly raise your right leg (making it parallel to the floor). Hold this position for 30 seconds, then slowly return to normal position, and repeat on left leg. Do it 10 times twice a day. How to do Step Ups? Stand in front of the stair (or stool) with feet spread shoulder-width apart. Step onto the stair with your right foot, and then with your left foot (similarly like you climb stairs), step down in reverse with the left foot first touching the floor, followed by the right foot. Do this for about 20 seconds at a time and repeat it 10 times a day. How to do Reclining Hamstring Stretch? Lay down on your back on a mat with straightened legs. Lift up your right leg, and pull it toward your chest with your hands until you feel a comfortable stretch (you may take help of a strap). Hold this position for 30 seconds. Relax and repeat with other legs. Do it 3 times once in a day. A 2010 study in the journal Physiotherapy found that doing hamstring stretching significantly increases knee extension range of motion in patients suffering from knee osteoarthritis. How to do Seated Hip March? Sit up straight on a chair with feet relaxed on the floor. Bending your knee, lift your right foot off the floor and hold it in the air for 3 seconds (if it pains, use your hands for support). Slowly lower your foot to the ground. Do two sets of 10 repetitions. Switch legs after each set. How to do Pillow Squeeze exercise? Squish the pillow by squeezing your knees together. Hold for 5 seconds. Relax. Do 2 sets of 10 repetitions. How to do Static Quadriceps Exercise? Sit straight on a flat surface and keep a towel under your thighs. Tighten the muscle at the front of your thigh (quadriceps) & push your knee down into a towel. Hold for 5 seconds and repeat 10 times as hard as possible pain-free. How to do cycling exercise? Sit on a stationary exercising cycle and slowly start peddling. At the bottom of the pedal stroke, the knee should bend at a 15-degree angle. Start with 10 minutes and gradually increase time. It is important to do exercises consistently and correctly. Walking is a good exercise but not a substitute for stretching and exercises. If pain doesn’t go away with an exercise program, consult the doctor. You can take painkillers before performing the exercise to ease pain and stay active. Don’t set unrealistic goals. 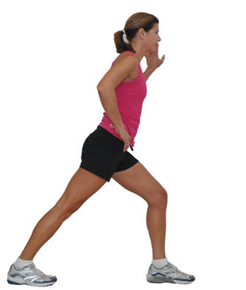 Gradually increase exercise reps.
Don’t bend the knees excessively. Never push through pain while exercising. You may be doing your joints more harm than good. Don’t overlook your weight. Do not risk a fall. Don’t bounce when you stretch.